Cajun rice dressing is a recipe that you can get creative with because so many things are good in it. Here's one of many ways, and, the way I usually cook rice dressing. This takes about 2 1/2 hours to complete. Great flavor takes patients! Now, if you want a plain rice and meat dressing with a little seasoning, this is not the route you want to take! 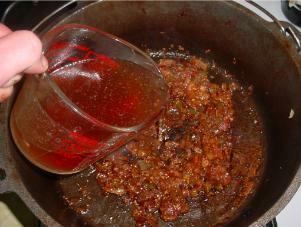 3 beef bullion cubes dissolved in 2 cups water. Optional: 1/2 each onion and bell pepper cubed (1" x 1"). On a low fire, render bacon about 15 minutes. Add onion and cook down for 30 minutes stirring occasionally. 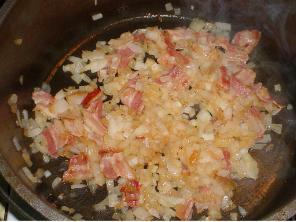 Note: if the onions stick, add a little water to deglaze the pot. This will actually give you a little gravy (that's good!). 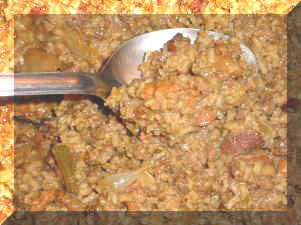 Start browning the ground meat and sausage on the side in another pan. 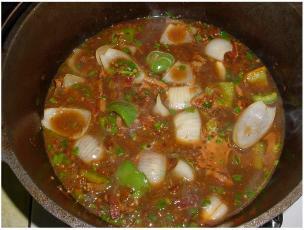 Back to the veggies.....Add chopped celery and bell pepper and continue to cook another 30 minutes, stir frequently. Add garlic and a little salt and pepper and cook another 15 minutes. You want everything cooked down well and brown. This is very similar to starting a brown jambalaya. When you're happy with the result add the bullion water. 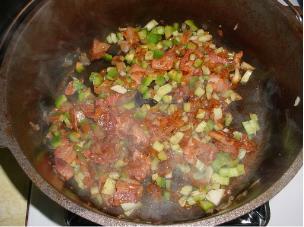 Add the cubed onions, bell pepper, green onions parsley and smoked meat seasoning; cook about 5 minutes. I bet you're wondering why the cubed vegetables were added! Well, if you like the flavor of onion and bell pepper you can get a little added treat by biting into one of the cubed veggies as you eat your meal... mmmmm. Remember, fully cooked and lightly cooked veggies have a little different flavor! Okay back to it... add the roux and bring to a boil. Taste the gravy, you want it slightly salty (slightly!). The rice will absorb this extra salt. Add the rice and stir. Lower the fire and cook for about 5 minutes. 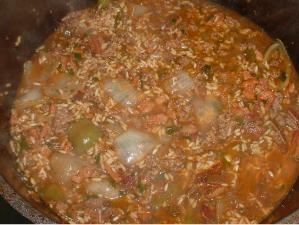 Add 1/2 the ground meats, Worcestershire and 1 1/2 cups of water. Bring to a boil, lower the fire to low, cover and cook about 20 minutes. Stir every 5 minutes. Note: Add water (if needed) to just keep the rice covered until it's almost done. Add the remaining meat and stir well. Continue to cook on a very low fire for 10 minutes. You may have to add a little water if it cooks out to rapidly. The end just takes time. You have to watch the rice to be sure it's cooked, and, you have to let the water cook out before serving so you don't have a mush! It takes time and a little practice but it's not that hard to do. I like to cook the rice in the sauce so it is full of the flavors that I've tried so hard to create. If you decide to do the rice on the side to be added later, make a bullion mixture with a few seasonings to cook the rice in; don't use plain water! Cook the sauce the same and add the pre-cooked rice then fold it in. When I'm in a rush that is what I do.